Take a fact-based journey through the cosmos. Tune in to hear weekly discussions on astronomical topics ranging from planets to cosmology. 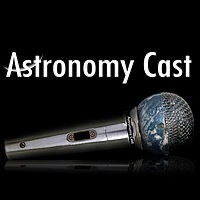 Hosted by Fraser Cain (Universe Today) and Dr. Pamela L. Gay (SIUE), this show brings the questions of an avid astronomy lover direct to an astronomer. Together Fraser and Pamela explore what is known and being discovered about the universe around us. Astronomy Cast is supported through individual donations and the sponsorship of Swinburne Astronomy Online.